DUET uses a horizontally extended screen, effected by employing two standard 16mm images placed adjacent to one another. Two vertical bars move back and forth across the width of half the frame. Through these apertures a girl is seen walking back and forth, in a similar manner to the bars. In this second form location changes were also used, and edited together in respect of position and direction of movement of the figure within the frame. Both these forms were considered unsatisfactory, but evolved into the form presented here. In many ways DUET is a game of chance; the constantly altering relationships between each of the movements effecting a continual ambiguity of space within the frame, both in area and depth. Si le cineaste les fait se prolonger, comme dans 'Links/rechts' (1968) de l'Allemand Lutz Mommartz ou dans 'Duet' de Roger Hewins, c'est moins pour donner une plus large illusion de realite en effacant leur frontiere commune que pour s'imposer la difficulte supplementaire de leur synchronisation et pour jouer de cette frontiere en la faisant traverser et retraverser : chez Mommartz par des polochons que deux personnages s'envoient d'un ecran a l'autre, chez Hewins par une jeune fille qui fait les cent pas dans un jardinet. Cela dit, ce qui passe d'un espace ecranique a l'autre peut n'etre pas aussi figuratif qu'un traversin ou une jeune femme de Birmingham : il peut s'agir, comme dans un des derniers films de Paul Sharits, de photogrammes colores ou, comme dans les 'Boucles pour deux projecteurs' (1977) de Christian Lebrat, de bandes de couleurs." 'Eloge du Cinema Experimental' , Dominique Noguez, Centre Georges Pompidou, 1979. The movement of each of the bars is fairly constant whilst that of the figure is erratic. Each section of the film, i.e. right and left hand images, was shot entirely at random - the matte being moved by hand and the figure's movement being decided by herself. DUET was preceded by two earlier forms; both of which were abandoned. 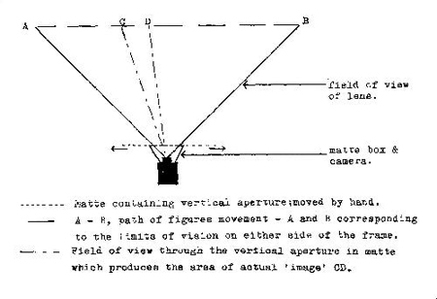 The first (Summer 1974) used a single image, the camera panning constantly between two points whilst the figure moved at random within, and without the frame. In the second version the camera described a circle, the figure moving along the circumference of circles at varying radii.